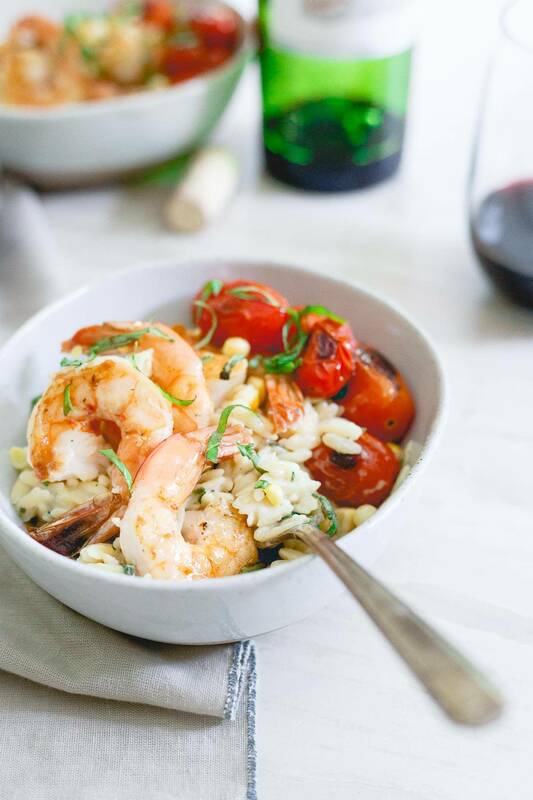 This brown butter shrimp is served on top of a creamy parmesan basil corn orzo and blistered cherry tomatoes for the perfect summer date night meal. We’ve been eating out A LOT lately. Nothing fancy, usually pizza to be honest, or better yet, chicken parm subs (I’m having a moment with them recently) but the amount of money going out the window on food is getting slightly ridiculous. Especially when you’re renovating a master bathroom, redecorating the entire upstairs, putting new tires on TWO cars (hi, that’s more than my mortgage payment), among other exorbitant boring adult expenses, etc. etc. I felt the need to reign the dinner scene in. And so, this brown butter shrimp with parmesan basil corn orzo came to be. It’s summer date night food and it’s good. Like really good. As if butter isn’t delicious enough, here’s its good-looking cousin, brown butter. These jumbo shrimp get hella cozy with some of it in a skillet before being placed on top of some of the creamiest orzo you’ve ever had. This orzo actually acts more like risotto than pasta. It’s made with just enough broth and milk so that once it’s cooked, it absorbs almost all the liquid in a creamy, parmesan-laced way before getting tossed with fresh summer corn right off the cob and basil. Pan-blistered cherry tomatoes cooked with some red wine vinegar for a bit of tanginess round things out. First bite in and you might be fooled to think you were eating out at a fancy restaurant, not in your own kitchen. Here’s the thing about a date night dinner in our house though: I like wine and he doesn’t. A meal like this, to me, is basically screaming for a new bottle of wine to be opened, whereas Ulysses can’t drink a sip without cringing his face in disgust like a toddler tasting a vegetable. Therein used to lie my dilemma: do I open a bottle and end up wasting half of it because there’s only so much wine I can drink by myself or do I settle for a bottle of cider like my husband will undoubtedly grab even though it’s not at all what I want to drink with a meal like this? Thankfully, I don’t have to make that tradeoff any more having now discovered zzysh®. 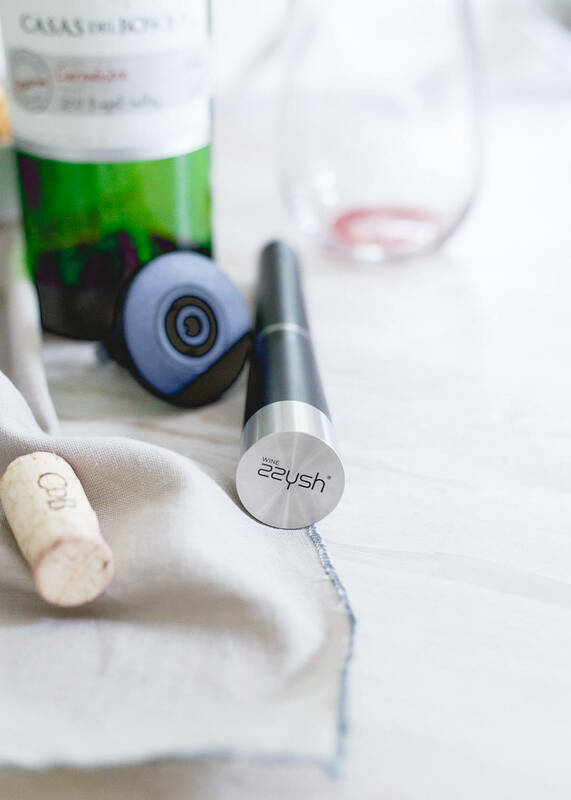 zzysh® was created so that you can now easily enjoy a single glass of wine or champagne without having to worry about what happens to the taste and flavor of the rest of the bottle. It’s an easy and affordable way to preserve the contents of your open bottle so that the second glass will taste just as good as the first glass. Literally, the perfect solution for me and my wine-hating husband household! Once you’re ready to preserve your bottle of wine, you simply place the stopper in the wine bottle (where the cork would normally go), make sure a new cartridge (filled with 99.9% pure argon gas) is secured in the hand piece, connect the hand piece to the stopper, press down for 3-4 seconds and listen for the “zzysh” sound. The “zzysh” is actually the argon gas replacing the air in the bottle, enveloping the wine in a protective atmosphere so no oxidation occurs for weeks. This is what protects the flavor, color and quality of the wine in the bottle. They make a zzysh® just for champagne too in case that’s more your style. 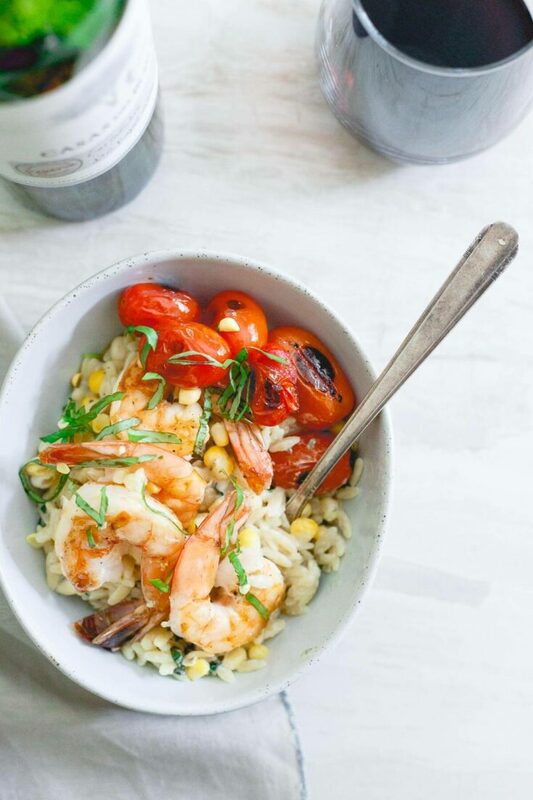 I’ll stick to the wine though and a big bowl of these brown butter shrimp with parmesan basil corn orzo. Summer date night dinner perfection. Love this brown butter shrimp recipe? Try these other shrimp recipes: Shrimp Caesar Salad Stuffed Sweet Potatoes, Citrus Grilled Shrimp Skewers, and Blackened Shrimp Tacos with Grilled Corn Cherry Salsa. Interested in trying zzysh® out? Use code: getyourzzysh to get 20% off your purchase of any zzysh® product. Place the butter in a medium sauce pot over medium heat. Once melted, add the flour and whisk until well combined. Cook for 1 minute, whisking constantly. Add the broth and milk to the pot, whisk thoroughly to combine. Whisking frequently, bring to a simmer. Add the orzo to the pot, stir, reduce heat to medium-low and cook for about 8 minutes, stirring frequently. Mixture will thicken substantially by the end of 8 minutes. Add corn, basil and parmesan cheese, stir to combine and remove from heat. Season with salt and pepper to taste. Place the olive oil in a skillet over medium-high heat. Add the tomatoes and toss to combine in the oil. Add the vinegar to the skillet, shake and cook for about 5 minutes until blistered on all sides. Remove from heat and set aside. In a large, clean skillet add the butter over medium heat. Stir gently and let butter become foamy and start to darken. Once this happens, add the shrimp to the pan in the melted butter. Cook for about 2 minutes per side until pink and cooked through. 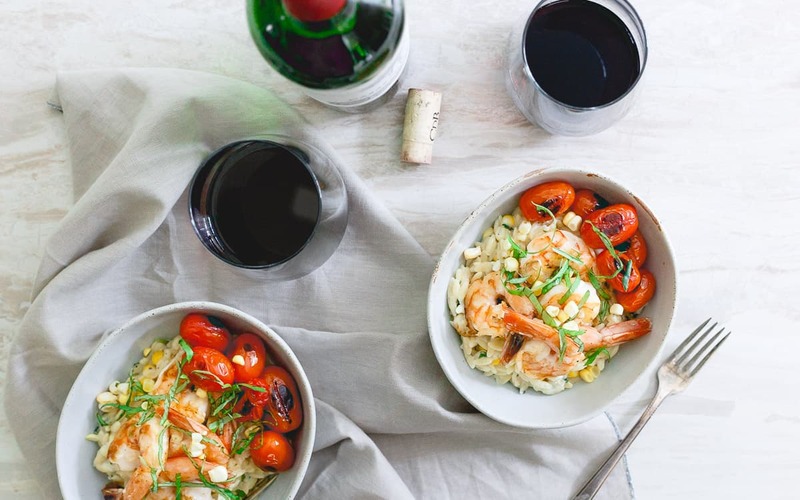 To serve, spoon the orzo in the bottom of a bowl, top with shrimp and tomatoes. Garnish with additional basil and parmesan. Love a date night in and this meal looks perfect! I am definitely going to be checking out this way to preserve wine too! Total date night perfection Gina! You had me at brown butter. And add some shrimp and fresh summer corn and I am so in. Looks incredible. Love that wine stopper too. My husband needs that! Ok, that wine preserving system is exactly what I need. I don’t drink much, but I love a glass of champagne or prosecco. I can’t always find the little bottles, and a big bottle just for me is a waste since I only drink one glass typically… so I sometimes “make” my husband share with me, but it’s just not always practical. I’ll have to look into it some more. This dish looks absolutely fantastic for a date night in! DEF need the zzysh® for champagne!!!!! The brown butter shrimp looks incredible!!! The perfect summer dish! girlfriend, you speak my food and wine love language! All the brown butter!! Brown butter shrimp? With orzo?!? The perfect combo! Brown butter and shrimp? This is totally calling my name! That wine stopper looks AWESOME. As well as the shrimp and orzo…especially when I have everything on hand right now to make it! Does the corn need to be cooked before its cut off the cob? No, you can cut it off raw. Is there anything better than brown butter?!? This looks so delicious!!!! I made this orzo last night and served it with pan seared scallops. We loved it! I added an extra ear of corn kernels but otherwise followed the recipe. Super fresh tasting and quick and easy to make. I did have to cook a couple minutes longer as the orzo was a little crunchy at 8 minutes. Will definitely make this again.